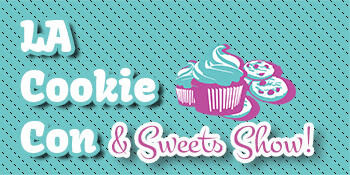 L.A Cookie Con and Sweets Show - 2nd Year & Just When You Think it Can't get any Better... it Does! 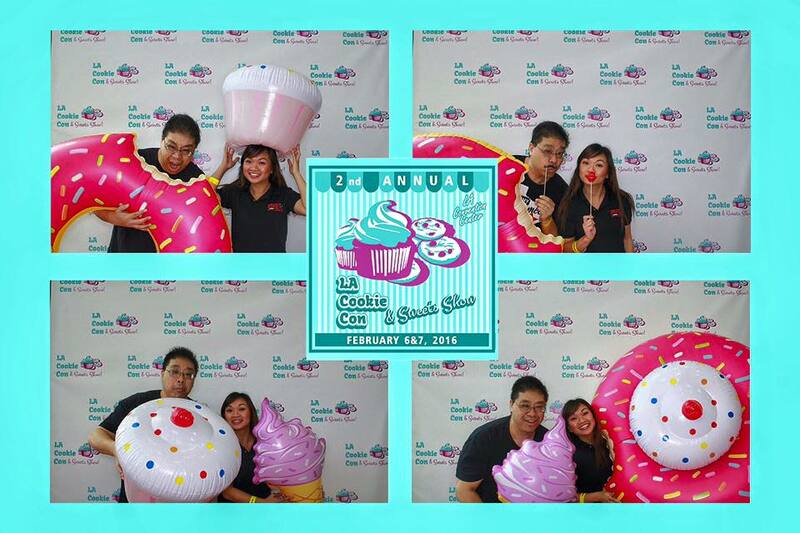 The 2nd Annual LA Cookie Con and Sweets Show took place on February 6 & 7, 2016 at the Los Angeles Convention Center. Both 2015 and 2016 shows were sold out. Follow @LACookieCon on Social Media for news on next year’s (2017) LA Cookie Con and Sweets show. Huge thanks to Kim and Jennifer for making sure we were able to cover the "sweetest" event of the year! The LA Cookie Con and Sweets show is the premier place to come and find out about what is new and hot on the sweets scene. There is something for everyone. If you are looking to learn how to decorate, there are demonstrations almost every hour. For the baking connoisseur, there are dozens of booths to browse through for inspiration, or plenty of new dessert shops to satisfy any cravings. One of the newest focal vendors this year is Co-founder Sarah Michelle Gellars company, Foodstirs. This new lifestyle brand was made to help bring family together without the stress of going looking up recipes, buying ingredients or measurements. This monthly subscription includes a box with all of the ingredients and supplies. 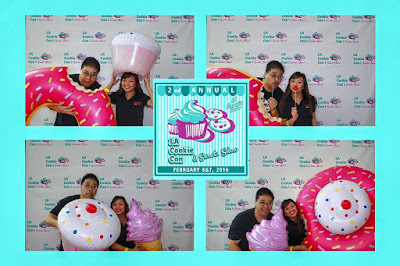 The first day included cake decorating competitions with guest appearance from Food Network and Pastry Chef-owner, Ron Ben- Israel as the judge for the competitions. 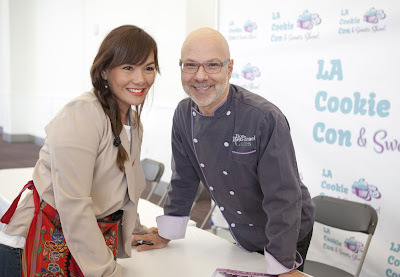 With a special surprise appearance from Food Network’s “Cake Masters” star, Duff Goldman taping the show with LA Cookie Con's audience as the cast. PC Calvin Lee - Aren't they the Cutest friends in the most sweetest place! Even though day two of LA Cookie landed on the same day as Super Bowl 50, the crowd was ecstatic with perfect attendance record. The admission line wrapped around the Convention Center outside of the building. Youtube Celebrity, Author and Baker Extraordinaire of Nerdy Nummies, Rosanna Pansino met and took photos with Nerdy Nummies fans. Nerdy Nummies cookbook is an extended version of Rosanna’s youtube videos with simple instructions to make emojis pastries or comic book themed cookies. Throughout the day, there are cake decorating demonstrations from recent MasterChef and Pastry Chef executives, hands-on courses from baking supplies vendor, Bakery Bodega. Check with the program book for time and show details. I’d recommend wearing comfortable shoes to conferences and tradeshows. There's always a lot of walking-- it’s best to be comfortable and agile than cheerless. The show is located in South Hall of the Los Angeles Convention Center at a decent size conference hall. * It would be woeful to walk around in uncomfortable shoes or have achy feet during the event. * My second advice is to bring a small water bottle. Sampling sweets all day will make a person thirsty or blood sugar to strike. It's best to have water on hand when needed. There were a drink vendors, though the ratio of drink vendors compared to sweets and cookie vendors were about 1:15. * And lastly, come on time to visit all of the booths to sample and learn more about the company. Also... If you or your child is allergic to nuts or gluten products, be sure to notify the vendor before sampling. If you are unsure, just ask! After a morning of sweets, walk over the block to LA Live to check out their dining selections. There’s an array of restaurants from casual to fine-dining to choose from. LA Cookie Con is wonderful place for new connections and friendships and celebrity sighting. Every Year More Celebrities are added!